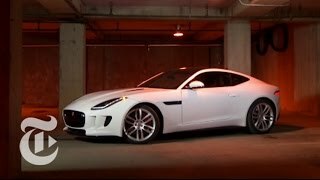 The Jaguar F-TYPE R Coupe, the most dynamically capable, performance-focused, production Jaguar ever, has made a dramatic debut in Los Angeles at Raleigh Studios. 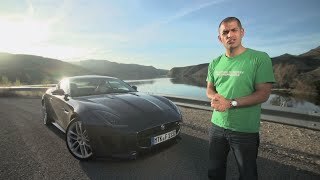 The Jaguar F-Type R Coupe's aerodynamic bodywork - gloss black front vanes beneath the shark gills and flat side sill extensions - aid its stability at the very high speeds. The window finishes are highlighted in bright anodised aluminium, with the grille surround and side air vents in bright chrome. The front splitter, side power vents, door mirrors casings, bonnet power vents and engine cover are also available in carbon fibre. 20” 'Gyrodyne' wheels in silver finish are standard on the F-Type R Coupe, while a dark grey and diamond-turned version is optional. The R Coupe's driver-focused cabin clearly conveys the car's pedigree and sporting prowess, through a combination of taut, technical styling, involving interfaces and premium materials and textures. 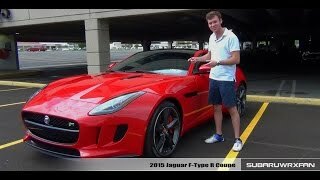 The 2015 Jaguar F-Type R Coupe is powered by the 5.0-litre V8 supercharged engine producing 550PS and 680Nm of torque. It can accelerate from 0 to 60mph in 4.0-seconds and can reach a top speed of 186mph (electronically limited). It features Jaguar's second-generation Electronic Active Differential to deliver enhanced agility and exploitable handling at the limit.